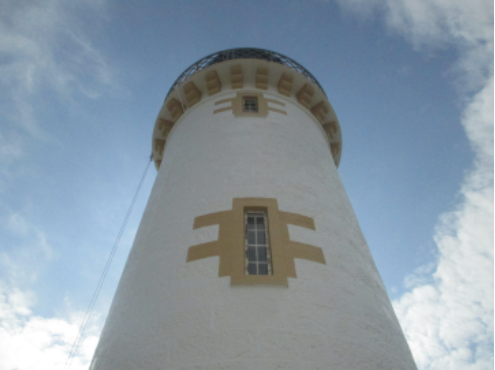 Overview TRAC were contracted to refurbish and upgrade Little Ross Lighthouse. The lighthouse is situated on Little Ross, an uninhabited Island at the mouth of Kirkcudbright Bay in the Solway Firth. It is next to Meikle Ross on the mainland, and the two small rocks off it, Sugarloaf and Fox Craig. The island is designated as a site of Special Scientific Interest (SSSI).Measures must be considered to minimise impact of the works on the Natural Heritage. A separate Beacon tower required rope access repairs and refurbishment. Little Ross is entirely uninhabited and only accessible by private charter from Kirkcudbright. Access is entirely weather dependent, requiring the teams to reside on the island during works. As there was no living accommodation on the island TRAC had to erect a site camp and establish welfare facilities prior to works. Due to the exposure of the site, the camp for the team was set up in the lighthouse station courtyard to afford best protection from the elements. The accommodation comprised: sleeping accommodation and living quarters with kitchen, shower and dry toilet all set up in sectional timber buildings. All had to be strapped down securely as gale force winds are common on all Lighthouse sites. Ship and Helicopter mobilisations were required to land all materials and equipment on site and to remove all at the end.